We are often asked by our readers to explain what is the difference between a domain name and web hosting? Many beginners don’t know that these are two separate things. In this beginner’s guide, we will explain the difference between a domain name and web hosting. Internet is basically a giant network of computers connected to each other through cables. To easily identify them, each computer is assigned a series of numbers called IP Address. Computers have no problem identifying and remembering these numbers. However, it is impossible for humans to remember and use these numbers to connect to websites on the internet. To learn more about domain names, take a look at our beginner’s guide on domain names and how do they work. A good way to think about this is if the domain name was the address of your house, then web hosting is the actual house that address points to. All websites on the internet, need web hosting. Web hosting companies specialize in storing and serving websites. They offer different types of hosting plans to their customers. See our article on WordPress hosting to learn more about choosing the right hosting for your website. Basically a domain name system is like a massive address book that is constantly updated. Behind each domain name, there is an address of the web hosting service storing the website’s files. Without domain names, it will not be possible for people to find your website and without web hosting you cannot build a website. You can also buy both the domain and hosting from the same company. Typically a domain name costs R120 / year, and web hosting normally costs R50/ month. Thankfully, Philzy Webhosting Technology is an official WordPress recommended hosting provider, has agreed to offer our users a free domain name and over 60% off on web hosting. Once you have purchased hosting and registered your domain name, you can start building your website. For complete step by step instructions, see our guide on how to make a website. You can buy domain name and web hosting from two different companies. However, in that case you will have to point your domain name to your web hosting company by editing its DNS settings. For example, let’s say you purchased your domain name from Godaddy and bought your hosting from Hetzner. Now you want to move your domain name to Bluehost, so that it is easier to manage and renew. Note: We recommend you to wait at least 45 days after the registration or renewal to initiate the transfer. ICANN, the international organization that oversees domain names, requires one year renewal whenever a transfer is initiated. By transferring your domain name before that period you could lose that year’s renewal fee. Can I Move My Website to Another Web Hosting Company Without Changing Domain? Yes, you can do that as well. You own the domain name and can change its settings to point it to any web hosting company. For example, you purchased your domain name and hosting from Godaddy, and now you want to move your web hosting to Bluehost. You can move your site from one host to another by simply transferring files and data. After that you need to edit your domain name settings and point them to your new web hosting provider. Another example, you purchased your domain name from WordPress.com (See our guide on the difference between WordPress.com vs WordPress.org). Later you want to move to self hosted WordPress.org website. First, you will need to sign up for a WordPress hosting account. After that you can move your site from WordPress.com to WordPress.org. Lastly, you will just edit your domain name settings on WordPress.com and point them to your new WordPress hosting provider. 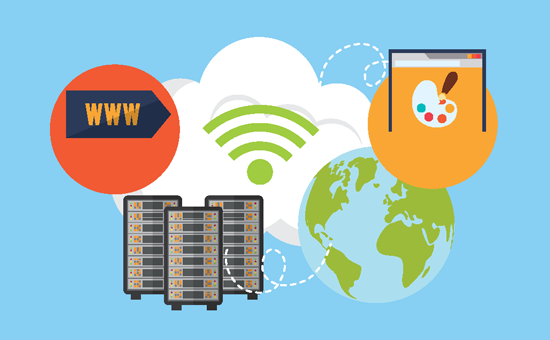 We hope this article helped you learn the difference between a domain name and web hosting. You may also want to see our comparison of popular website builders for beginners with pros and cons.